Well, in my case the answer is “last year” and “yes” — the latter because we all have recycling bins in my neighborhood, so pretty much everything gets recycled with no effort on my part. The really mysterious part of all this, though, is that despite the fact that phone books seem like they ought to be a dying breed, there are more of them than ever. 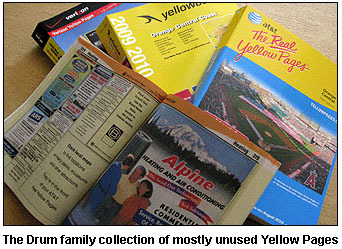 I just looked, and we have not one, not two, not three, but four different yellow pages directories. One from Verizon, one from Yellowbook, and two from AT&T (they come in two different sizes for some reason). They’re all crammed with ads, which must mean people are using them, but I do sort of wonder who that is sometimes. I use the web almost exclusively for this kind of thing these days, and I imagine that most people in my upscale neighborhood do too. So why all the phone books?